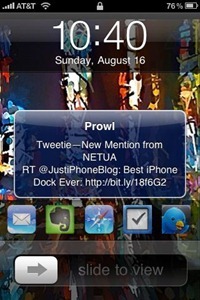 Prowl “ the iPhone Growl client app “ has had a very nice update this weekend, and added some slick new features. 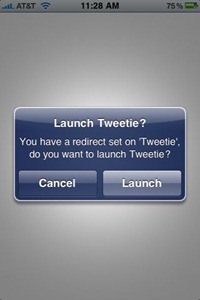 The biggest of those is redirections “ which let you launch a different app right after Prowl launches for push notifications, based on rules you define. So, for example, I can tell it to launch Tweetie (or even Twitterrific if I preferred) each time an alert from Tweetie on the desktop hits via Prowl “ with or without a confirmation message each time. This is a great new feature in my view “ as going into Prowl itself is not of much use beyond just reviewing what alerts have come in recently. Another notable new addition is four new sounds, and the ability to set different sounds for different notification priority levels. The new sounds are quite good ones “ not too loud or obtrusive, but very easy to hear and very attention-grabbing. The third big new feature is Quiet Hours “ which will let you set an interval during which only badges get updated, so you don ‘t get any popups or sounds messing with you during whatever timeframe you setup for this. I haven ‘t been able to test out Quiet Hours as yet, since there ‘s a bug in this version that causes the app to crash back to the home screen when making certain settings changes “ including this setting, for me at least. An updated version that fixes this issue has already been submitted to Apple. Prowl is an impressive app, and this is an impressive update for it. You can find the latest version in the App Store now, priced at $2.99. *** Please Note: Prowl is a Growl client “ so it pulls its alerts from Growl “ and requires Growl 1.1+ on the Mac or Growl for Windows or Snarl on a Windows machine. Yup, I have the same result, as I mentioned – but the devs already have a new version which fixes the issue submitted to Apple. So hopefully not too long before we see that fix. ah.. that's good to know. thanks for the reply..
Sure thing – hope it doesn't get held up. I assume, looking at the first picture, that you have an app that can open apps straight from the lockscreen. What app is that? FTA: "*** Please Note: Prowl is a Growl client – so it pulls its alerts from Growl – and requires Growl 1.1+ on the Mac or Growl for Windows or Snarl on a Windows machine." Good point – that's mentioned on their App Store page and I overlooked it, though it also states that the Mac or Windows apps are required. Hi, nice article to read! The only problem I have with redirections is the Mail. When I set Mail to redirect to the Mail App, it opens a screen where you can type a new e-mail. Not really my inbox though? Glad the app is serving you well. Sorry to say, I don't have any tips on the email subject – have never wanted to turn on push for that.